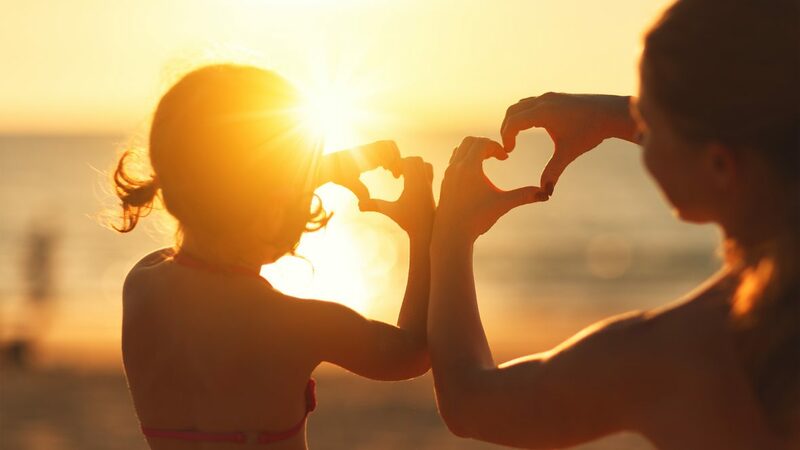 Mommy And Me Swimwear… What could be cuter? Summer is finally here! And it’s most definitely our favorite season. 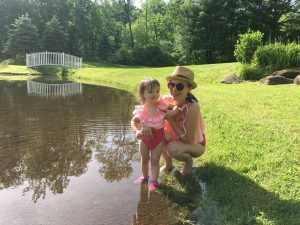 My family spends a ton of time getting wet–whether via sprinkler, pool, pond, lake, or water park. We practically live in our bathing suits from the moment it hits 65 degrees until September. And I have to admit, I have a thing for cute bathing suits. Maybe more than a thing… an expensive obsession?!? 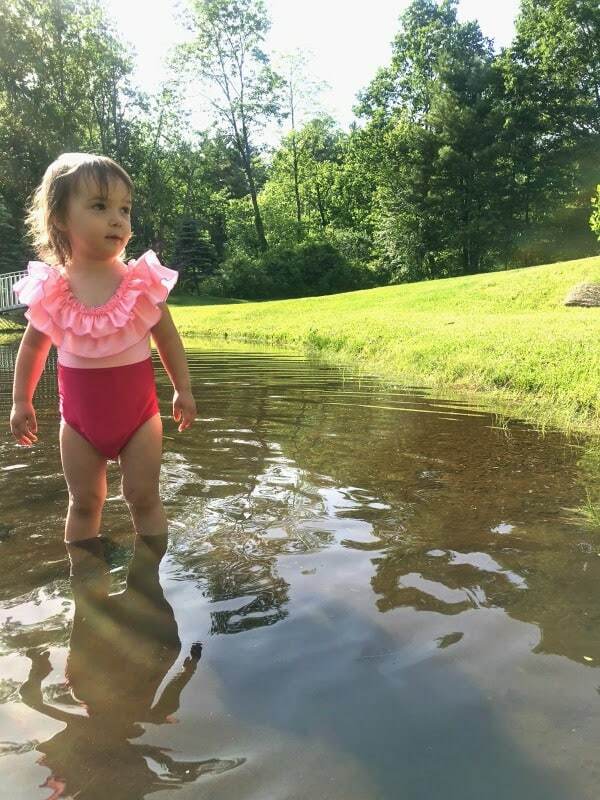 Last year, my one-year-old daughter had about six bathing suits. And I’m a sucker for anything retro. But this year, I’ve found a way to step it up. 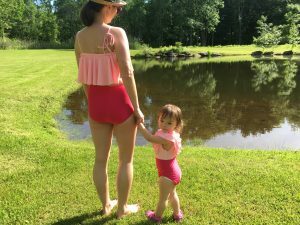 Not just adorable bathing suits… matching bathing suits! 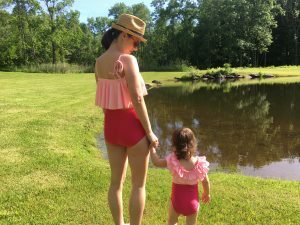 Enter Moderne Child Shoppe and their super stylish Mommy and Me swimwear line. They sent me a pair of swimsuits for my daughter and I to sample and we fell in love! The suits (style named “Fawn”) were very well-constructed. The little one’s is a one piece and mama’s is a two-piece. My favorite feature is the retro-chic high waist with belly hiding ruching. Because let’s face it, these abs just are not going to return to their pre-baby shape. The top can be worn both with and without straps for an off the shoulder look. The cups are lined and padded. The daughter suit can also be worn both on and off the shoulders. It comes with an adorable bathing cap, not pictured because my daughter is just too darn stubborn to keep it on. This suit does run a bit big for the little ones, so you may need to size down to get the perfect fit. 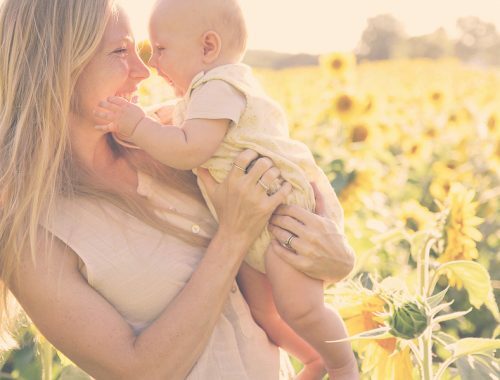 Both mom and daughter felt cute and had a great time. And if you think these suits are adorable, check out the other Mommy & Me Fashions at Moderne Child Shoppe. They have the cutest dresses, tutus, shaws, sunglasses, T-shirts, and hats for moms AND daughters! Disclosure: We received complimentary swimwear to try out for this post, but our opinions are genuine. 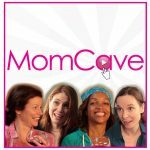 Jennifer Weedon Palazzo is the creator of MomCaveTV,com, an online network of comedy shows for moms including Slummy Mummy, Slacker Mom, Double Leche, Blabbermom, and MomCave LIVE. 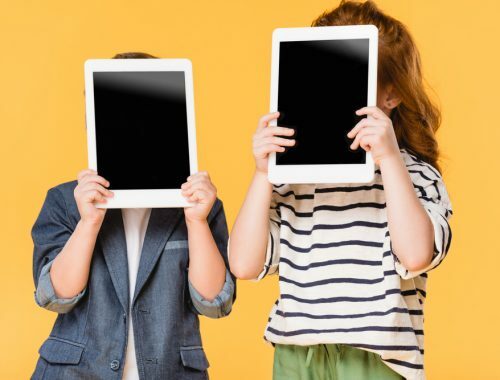 When she’s not writing about the funny side of being a mom for sites like Scary Mommy and Mamalode, Jennifer can be found eating Reese’s Cups while furiously bidding on vintage clothing on eBay. She splits her time between Manhattan and the Berkshires with her husband, Evan, bandleader of The Hot Sardines and their two kids. Follow her on Twitter @MomCaveTV and visit https://www.youtube.com/MomCave.